It’s going to be very adventurous at the terra mineralia in the winter holidays: we’ll be talking about mineral lighting (fluorescence) and forgery, magnetism and natural earth radiation. The topics have been put together as a comic this time. It starts with the abduction of innocent minerals by the mysterious Professor Nova. People say he’s changed snow-white rock crystals into smoke-grey quartzes and coloured purple amethyst into honey-yellow citrine in his secret laboratory in order to sell the mutants at a great price. But if you pay attention during the holiday programme, you’ll learn how to convict the professor. And more. On a mission straight through the mineral exhibition, our young visitors will meet lots of superheroes. They use the same superpowers as the professor, but for good instead. They have strange names like Iradia, Micro, the UV brothers, the Doc and Flash. Even the earth is one of the superheroes, since it protects us from dangers in space with a big protective shield. Our young adventurers will be able to test for themselves how these superpowers work: they can fly along in an electron cloud, or see how a chain reaction can be set off with just a tiny little push. Especially brave hunters will find a medal waiting for them to take home. Our little adventurers will also meet shape-shifters along the way. At first they seem just as mysterious as the superheroes. But in fact, they’re something quite different. By day they appear quite normal, like all your mineral friends. But in the dark they might wear the craziest colours. This isn’t just spectacular; it’s also quite useful. This trick has often helped to find the culprit in real criminal cases, and in the terra mineralia you can find out just how it works. So this winter the place is just so full of cool peeps that the boys and girls absolutely must get to know as future heroes. The holiday programme takes place from 7. – 22. February 2015. Monday - Friday from 10 am until 5 pm and until 6 pm on weekends. Kids clubs and childcare groups are requested to register in advance. For more information, please contact the Info Desk on 03731 394654 or fuehrungen@terra-mineralia.de. Tickets costs €8 for adults, €4 for children, and €18 for families. Winter Holidays Programme "Mutant Minerals! ", 7. - 22. February 2015, from 10 am. Mineral: Fluorite, Minerva #1, Cave-in-Rock, Illinois, USA, Picture width: 3,7 cm, Photo: Jörg Wittig, Dresden. 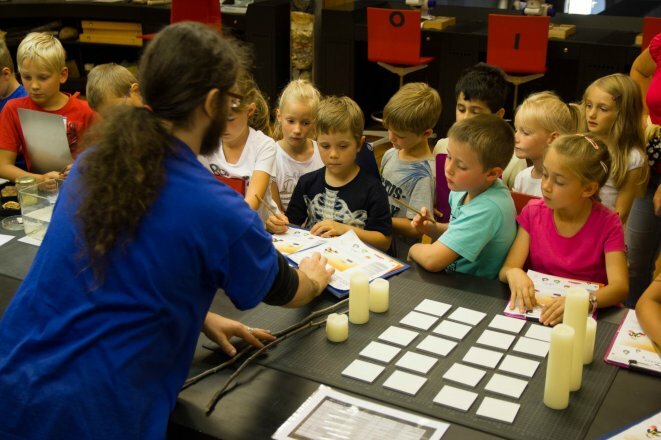 Winter Holidays Programme "Mutant Minerals! ", 7. - 22. February 2015, from 10 am. 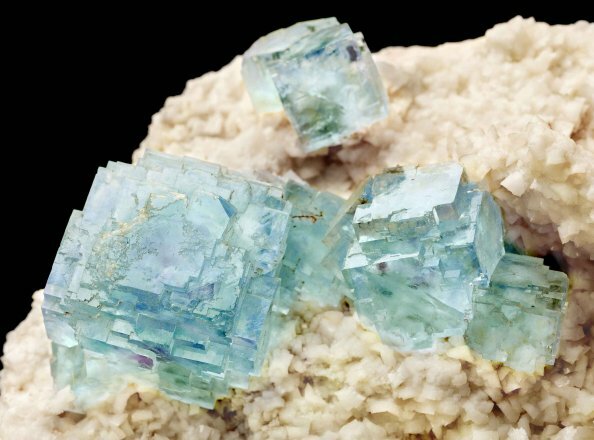 Minerals: Fluorite on Dolomite, Shangbao Mine, Hunan, China, Detail: 11 x 9 cm, Crystal size up to 4 cm. Photo: Jörg Wittig, Dresden. 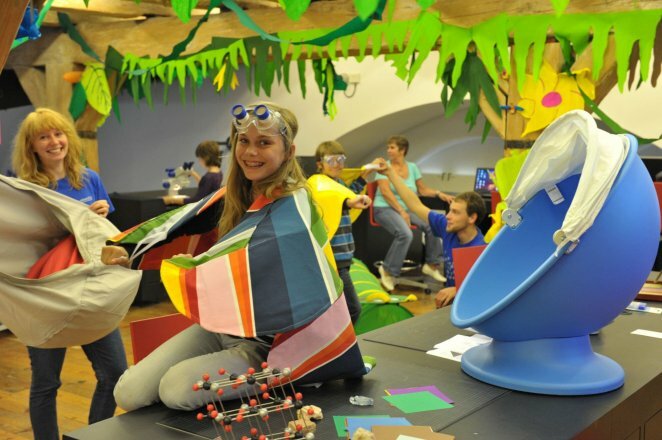 It’s going to get really colourful during the Easter holidays from 2 to 12 April at terra mineralia, TU Bergakademie Freiberg’s permanent exhibition. The successful Flying Jewels special exhibition is back at Schloss Freudenstein with new exhibits: insects and minerals whose colours and structures are intriguingly similar to one another. But where do insect-wing and mineral patterns come from? 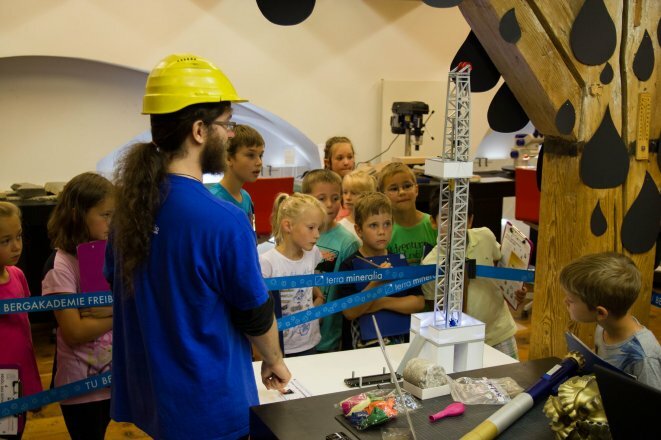 Kids from age 7 upwards will be able to investigate this question in the “Forschungsreise”, terra mineralia’s science centre. We’ll be splitting light with a prism, breaking down black ink from a felt tip pen, looking at the colour wheel with its complimentary colours and investigating optical effects like reflection and absorption. Because, even though minerals are unbelievably colourful, their vivid colours aren’t always “real”. We’ll look at this phenomenon more closely by performing the powder colour experiment. Shimmering wings also have their little tricks for looking particularly beautiful, just like minerals. But of course beauty isn’t the only reason why insects and animals need their colours. On a short excursion into the jungle, the kids will get to know the most important roles an animal’s colourful coat plays. That just leaves us with the question of whether a butterfly is just as colourful when it comes into the world? 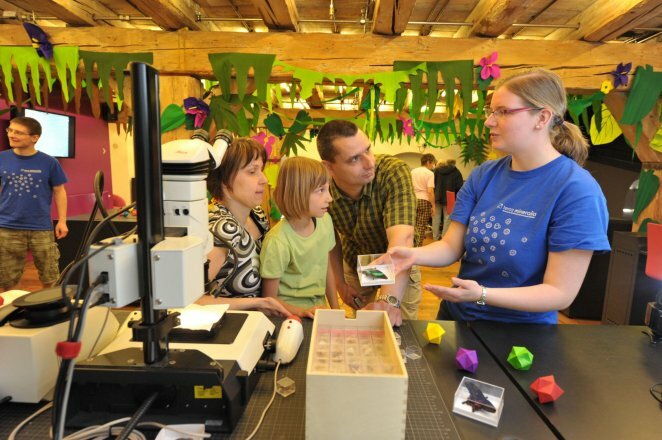 A butterfly trip will give us the answer, where kids can see the insect’s powers of metamorphosis up close. After all this excitement about colours, anyone who wants to do something a bit more hands on is welcome to the cutting workshop in the entrance hall. Geyer’s “Toni’s Haus der Steine” (“Toni’s House of Stones”) will be on hand with practical hints and tips for making beautiful minerals even more beautiful. Because most minerals only really come into their own when they’re properly cut. We’ll have uncut stones at the ready, but you’re also welcome to bring your own crystals from home. Uncut stones cost €3 each for visitors to the terra mineralia and €4 for other guests. The holiday programme runs daily from 2 to 12 April, starting at 10am. Kids groups and clubs are requested to register in advance. Further details are available from the Information Desk on 03731 394654 or fuehrungen@terra-mineralia.de. Tickets cost €12 for adults including access to the special exhibition, or €3 for kids. A family ticket costs €30. Still nothing planned for the bank holidays? 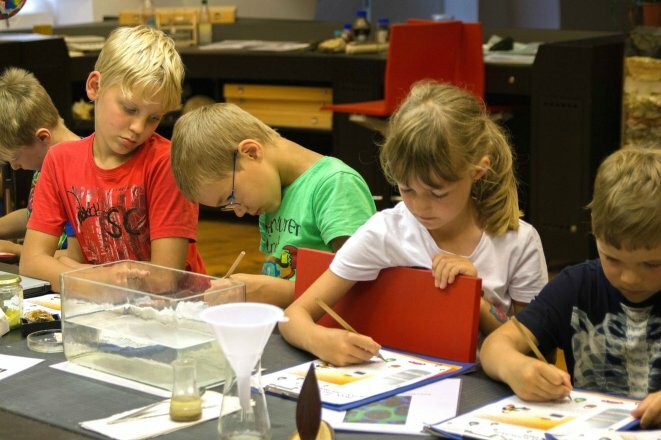 The “Forschungsreise” offers exciting experiments for visitors young and old. Come and be amazed! Diamonds are considered the most valuable and most sought-after precious stones in the world. Many fascinating legends, mysteries and secrets surround them, but they are most often to be encountered in love stories. Even Cecil Rhodes, founder of the largest diamond mining business in the world, is reported to have said, “As long as there is love, there will be diamonds.” From a scientific point of view, diamonds are minerals and a modification of the element of carbon. They count as one of the toughest natural materials in the world. Diamonds are the focus in the terra mineralia Forschungsreise this month and we’ll be examining them extensively using a range of experiments. Participants will learn where they can be found and under what geological conditions diamonds arise. We’ll be demonstrating how complicated the process of crystal growth is by cultivating salt crystals under the microscope – essentially the same process. Synthetic and natural diamonds can also be viewed under the microscope side-by-side, but can you see the difference? We’ll also of course be looking at the hardness of diamonds. It is above all the crystal pattern that shows the precise reasons for this. In addition to this, visitors will be able to test the authenticity of their own diamonds and diamond rings. Two key test characteristics here are thermal conductivity and thickness. With the help of various test instruments, these features can be investigated for diamonds and for other minerals in comparison. Even if a diamond is indeed genuine, the question remains as to how to tell its value and what role the so-called 4 Cs play in this. 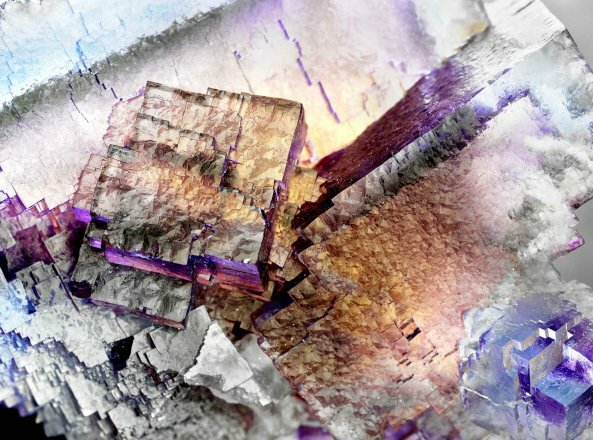 Alongside its use in the jewellery industry, the mineral plays a particularly significant role in technology, as do the other carbon modifications graphene, graphite and coal. Graphene itself, only recently discovered, will also be available for ‘production’. The programme of diamond-related experimentation will take place over Ascension and Pentecost from 10am. Further details are available from the Information Desk on 03731 394654 or fuehrungen@terra-mineralia.de. Adult admission to the terra mineralia, including the current Flying Jewels II special exhibition, costs €12; children’s admission €6; and family admission €30. It is a part of our everyday life: From the toothbrush we hold in the morning, to the lunch box at noon, the remote control in the evening and, of course, in our petrol tank when we drive to visit grandma and grandpa. Crude oil has been a popular raw material for centuries, used for a variety of different things. It can, after all, not only be used as liquid petrol, but can also be transformed into creamy ointments or beautiful Barbie dolls. Even the ancient Egyptians used crude oil. In our ‘expedition’, in the science centre of the terra mineralia, we will demonstrate what is so special about the ‘black gold’. We will conduct numerous experiments to show what characteristics make up oil and why, once it has caught fire, it can be so much more dangerous than burning wood. In this way, children will also learn what firefighters have to look out for and how they can protect themselves. We will also look at how crude oil is produced. After all, who knows what oil, dinosaurs, diamonds, and pencils all have in common? The secret ingredient is carbon. However, quite a lot has to happen within the earth before a drop of oil can be produced, and quite a lot more before it can end up as fuel in a tank. 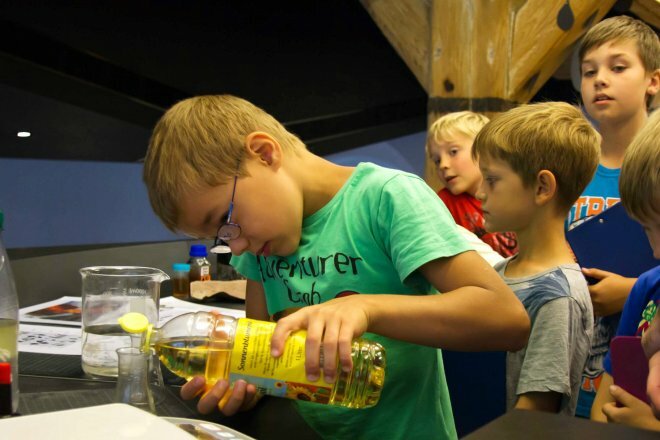 The most exciting thing for young geologists and mineralogists, however, are the questions: Is crude oil really always black and is it stored in the earth like salad oil in a bottle? Are oil deposits only found with the oil sheiks in the desert, or can crude oil also be won in Germany? How do drilling rigs and workers reach the oil, and what role do different rocks play in this? Armed with magnifying glasses, children can take on rock puzzles, watch a miniature drilling rig at work, and even draw out their own core, which they can of course take home. Finally, the young researchers can take a look into the future and see what a day without the black gold may look like. Since so much in our everyday life depends on this versatile material, it is not easy to live without it. Even older scientists can learn a lot here. The holiday programme will take place every Thursday till Sunday from 10 a.m. Children and school groups are invited to register. For further information, please contact the information desk at 03731 394654 or fuehrungen@terra-mineralia.de. Entrance fee to the terra mineralia is 8 Euro for adults, 4 Euro for children, and 18 Euro for a family ticket. The special ‘Flying Jewels II’ exhibition can be visited until 2 August. During the Autumn holidays, terra mineralia invites you to join in the “Mining fever”! 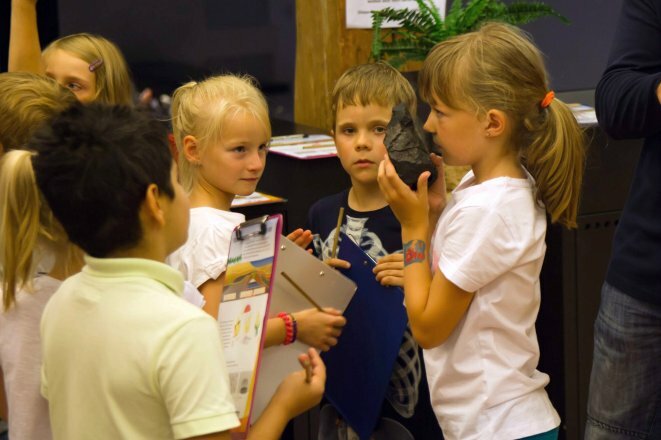 In preparation for the “Mining and the ‘white gold’” special exhibition (21 November 2015 – 28 February 2016), terra mineralia is calling all children aged 6 and over to join in the “Mining fever”. 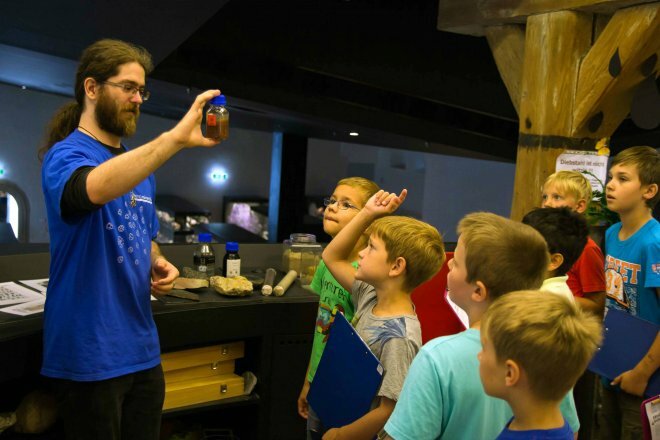 Young visitors will be taking a look at mining and will learn what happens when a new ore deposit is discovered. The programme begins with a journey into the history of mining. 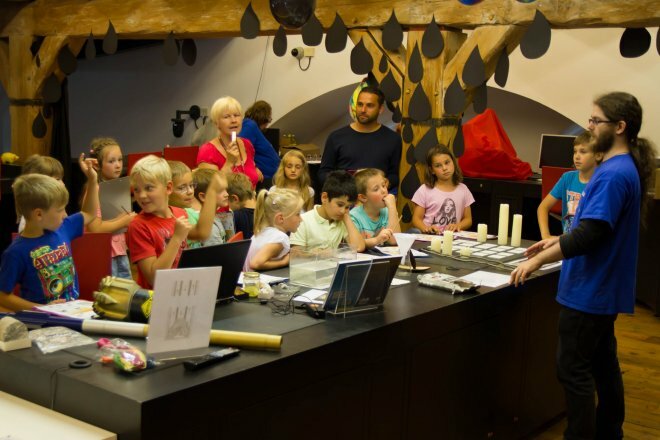 As they visit seven different stations, children will help a miner from the earliest days of Freiberg mining as he searches for his “seven Saxons”. During their search, they will learn what tools and clothing were important 800 years ago. Once they’ve found everything, they get to dress the miner using scissors and glue! Afterwards, in the Research Expedition - terra mineralia’s science centre - the children will themselves slip into the role of miners. A role play scenario will explain the various tasks of Chief Mining Administrator, haulier, faceworker or sorter boy. The children will play their own part in the scenario, learning the different mining trades and procedures in the process. A small gallery for mining ore during the programme has been built specially for this purpose. This is where participants will learn how ore was mined with a mallet and iron, and what role mine cars and manual rope haulage played in transport. Afterwards, the hard-working children will find a little reward awaits them. The second station is to do with the ore itself. Just what is ore? How are lodes of ore created, and what minerals do they contain? This is where children can hold samples of different kinds of ore in their hands and identify them. An experiment will demonstrate how ore lodes are formed by hot, mineral-rich waters in the cracks and crevices of the rocks. 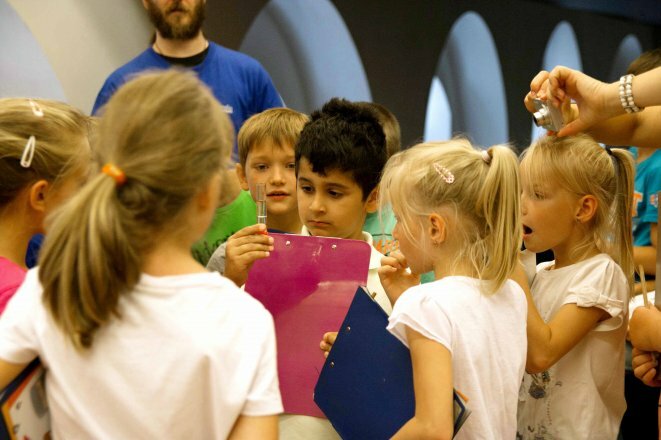 The “Mining fever!” programme runs daily from 10am during the autumn holidays (10 – 25 October 2015). Children’s and childcare groups are requested to register in advance. Further information is available from the Information Desk on 03731 394654 or fuehrungen@terra-mineralia.de. Adult entrance to terra mineralia costs €8, children’s entrance €4, and a family ticket €18.